The pair of Chinese enameled porcelain vases in Filoli’s drawing room are a particularly eye-catching example of this landscape theme. The pieces date to the Qianlong period, between the late 1730s and the 1790s. 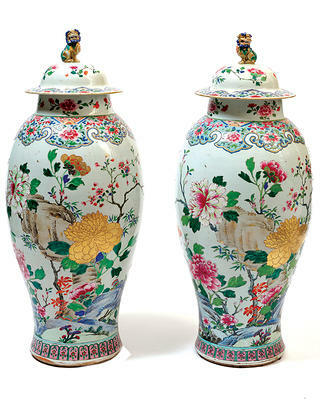 Likely made for export to Europe, the vases are painted with pastoral images of tree peonies over a rocky stream. Some of the largest peonies are gilded, and the covers of both vases are topped with an enamel Chinese guardian lion, a symbol of protection in Buddhist culture. The Bourn family, the original owners of Filoli, purchased the 29-inch-tall vases, possibly on a trip to Europe. The pair was displayed atop a mahogany commode in Filoli’s drawing room during the Bourn era and sold at auction in 1975, shortly before the second owner, the Roth family, gave the estate to the National Trust. Eventually, San Francisco antiques expert Ed Hardy bought the vases, and then realized they had come from Filoli when he spotted them in a period photograph. He donated them to the site’s collection in 2006. They’re now back in the drawing room, atop the same 18th-century commode, where they can be admired by visitors. “They just really are a beautiful example of the quality of furnishings the Bourns intended for Filoli,” DeVere says.